The Varadvinayak temple at Mahad is located on the highway linking Mumbai and Pune. 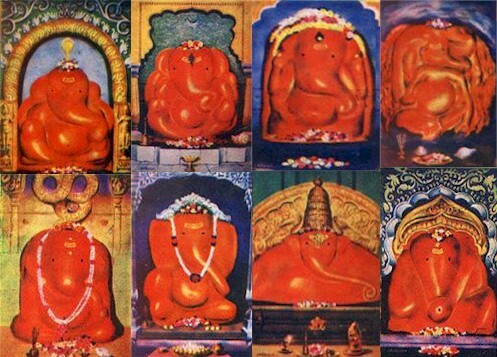 Mahadcha Varadvinayak is considered to be one of the Ashta Vinayak shrines of Maharashtra, celebrating eight instances of legends related to Ganesha. Legend has it that a rishi by name Vachaknavi was visited by a ruler by name Rukmangada, and during the visit the rishipatni Mukundaa expressed her attraction to the king. The king turned her down leaving her seething in anger. In the meanwhile, Indra, the king of the Devas came down to the earth in the disguise of Rukmangada and accepted her amorous moves. An illegitimate son Grutshmadha was born out of their union. The son, learning of the story of his birth was grief stricken, and prayed to Ganesha in Bhadrakavana for absolvement of the sins of everyone concerned. His prayers were granted by Varadavinayak of Bhadrakavana (now Mahad). The Temple: Varadavinayak is portrayed, seated on an east facing throne. Stone images of his consorts Siddhi and Riddhi are also seen in the temple. A lamp in this temple is said to have been glowing uninterrupted for over a hundred years.